Pick it, clean it, eat it, love it! 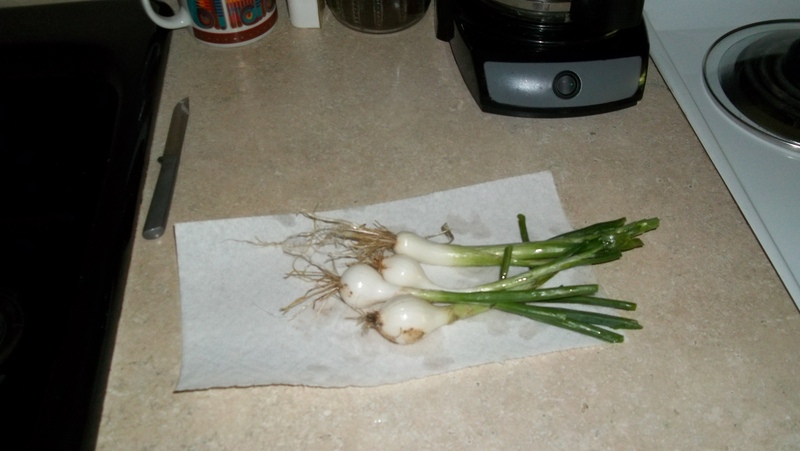 I’ve been eating onions right along for a couple weeks, and also spinach, but it’s almost summer and now the temp agrees. The spinach leaves have been getting thinner the last few days and now some spinach is starting to go to bolt, so there won’t be much more now till I plant some more in the fall. Some things can take the heat, some things can’t. 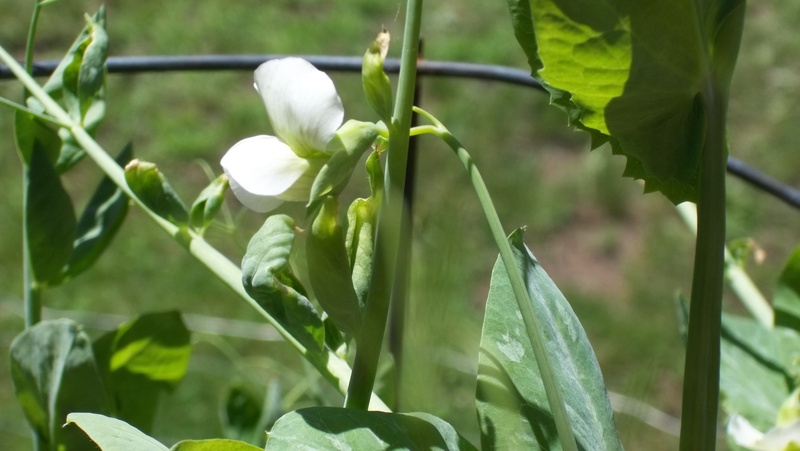 Peas are just starting to bloom, and green beans and black eyed peas (below) are getting off to good starts, ready to climb up fences and trellises. 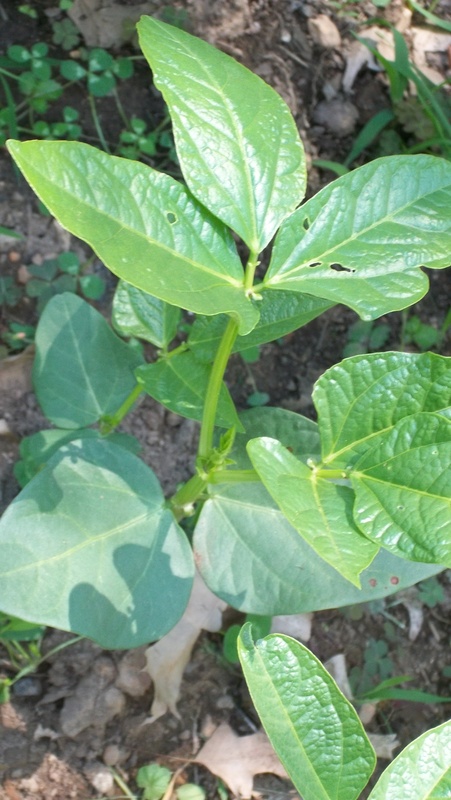 Black eyed pea plants are more robust than green beans, and take longer to produce, but fresh black eyed peas are worth the wait. I like to fry just a teeny bit of bacon with some onion, cook the fresh black eyes ( which are really beans) and then combine them with the bacon/onion mixture. Mmmm. 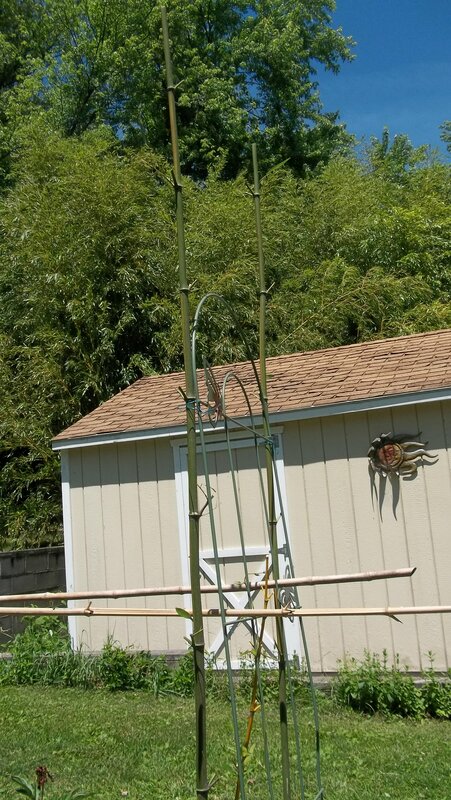 Lima beans are supposed to get 10′ tall, and there are only a few plants and they have a 6′ trellis, but I cut some bamboo and lashed the poles to the trellis, and the trellis now has a name. It’s called Encouragement, lol. 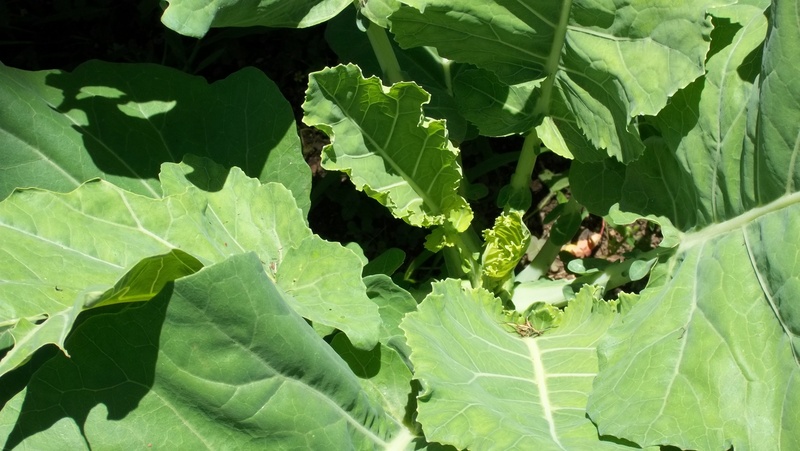 Collards are starting to leaf up well, but they get a head start on other things here in our weather, since they are not as tender and can be planted early. Cabbage the same. You can’t eat everything, and some things are just pretty. 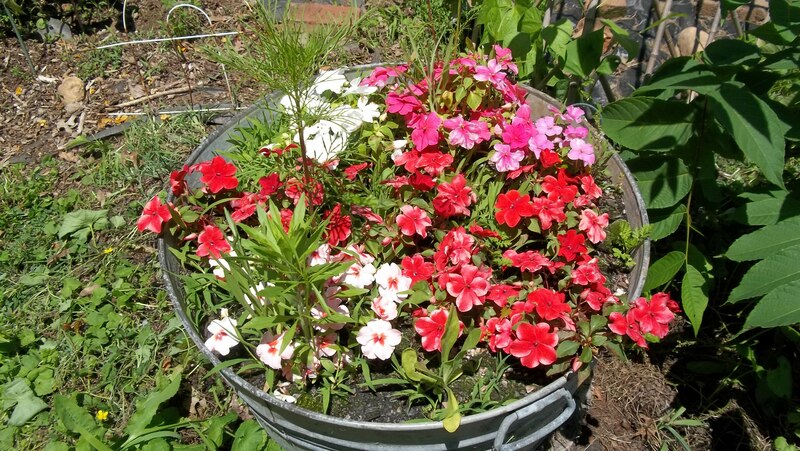 Like a washtub full of impatiens and a few wild flowers among them. Did you know that jewel weed, (that grows along the creek and will stop the itching of poison ivy if you rub it on your skin) is a cousin of the beautiful impatiens? Some time I need to get ambitious and go take a picture of jewel weed for those who aren’t familiar and have both poison ivy and jewel weed in their area. Here’s a medicinal herb called comfrey that was used as a poultice for lung ailments in the middle ages. It has jaggy stems and is extremely invasive, but it’s good for our pollinators so I let some grow around where veggies are growing. 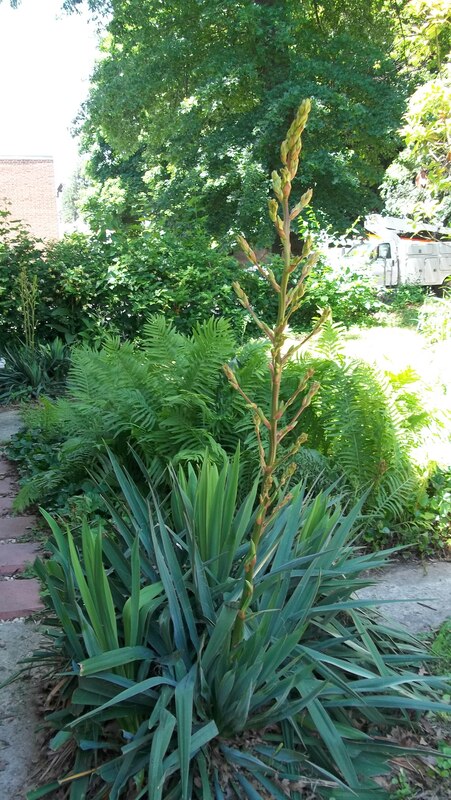 The yucca outside my back door is getting ready to bloom and the bloom shoot is now taller than me. People around here call them century plants tho the bigger ones will bloom every 3 or so years in this climate. It’s soon officially summer, and I hope all my readers are having a good spring and maybe growing good things. Maybe already eating some of them! Love ‘Encouragement’! It’s really cool. You must take a pic later when it’s covered. I’m growing comfrey too this year, I hear it really breaks up clay soil, is excellent for compost making, chickens love it, along with the fact it’s really good for burns, rashes and bug bites! I can only hope it will be covered! I told my friend across the alley that if she sees me down there with the ladder, it must have been true what they said about those seeds, lol. 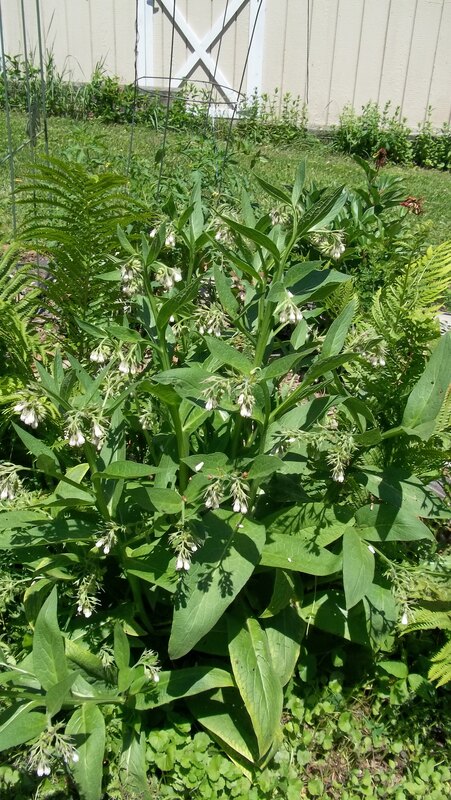 Comfrey attracts a lot of bees, and that’s good, but be prepared to be pulling it out places you don’t want it to be, cos it’s wild like mint.